We Desperately NEED Term Limits! “All politicians should be limited to two terms….. I wrote and published my first article about Term Limits and Special Interest in May, 2015. I have rewritten that article to make it more current and am republishing it for two reasons. Everything that has happened in America leading up to, and especially after the election on November 8. With the new Administration taking office on January 20 we actually have an opportunity to take America back from the Rino/Liberal corrupt and self-serving Washington politicians and the anarchist and irrational self-serving Liberals refusing to accept the November election results. Based on everything I have read and been told over the years the Founding Fathers saw elected office as a patriotic public service especially on a national level. In fact they were concerned about elected officials becoming professional politicians. This is evidenced by Benjamin Franklin’s reply to a woman who asked him a question as he exited Independence Hall with the announcement that they had agreed on a final proposed Constitution for our new country. She asked, “What have you given us Sir, a Republic or a Monarchy?” Without hesitation he replied, “A Republic Madam, if you can keep it”. To me this confirms that the Founding Fathers feared the concept of a national government run by career politicians. Every time I read anything about or think about our Founding Fathers I am amazed at how brilliant and far sighted these men were. The fact that such a diverse group of men agreed on a document, that is our current Constitution, is significant and Benjamin Franklin’s reply to the question is the evidence. As I wrote this article a comment by Juan Williams in his recent book, “We the People” really resonated with me. He questioned what our Founding Father’s reaction would be if they could walk the streets of America today. It was a reference to what America is like today politically versus their vision for its future. Every day I am literally stunned when I see the American flag trampled on here in America!, hear people shout down free speech at our colleges and universities, or hear people publicly say things like what Supreme Court Justice Ruth Bader Ginsberg said about our Constitution. In a televised interview she advised the people trying to form a new Egyptian government that they “should not use the US Constitution as a model for their new constitution”. This is a life time member of the Supreme Court of the United States of America publicly saying that our Constitution is “bad”! Obama’s public denigrating objections to the “Citizens United” Supreme Court decision. This from a man who publicly committed to accepting matching funds (with its restrictive fund raising regulations) for his first presidential campaign but then ignored the commitment and went on to break all campaign fund raising records with no concern for any related ethical or legal regulations regarding campaign fund raising. This included his campaign headquarters refusing to use approved software which would eliminate illegal donations from the same donor or possible foreign donors. He also had the CEO of Goggle staffing, paying for and managing a team of high end technicians to “mine” data and maximize campaign donations and election efforts. Loud public objections to the “Citizens United” decision have now been adopted by every ideologue on the “Left” including Hillary. It seems massive infusions of cash from any source are only OK when it is to the Liberals benefit! A commissioner with the Federal Elections Commission recently ruled that Harry Reid could keep all the money left in his reelection campaign fund and use it to fund a “transition office”. It seems that “loose” regulation of unspent campaign funds is common by the FEC, especially under the Obama administration. Lifelong professed Socialist Bernie Sanders and his family are Ok with using “other people’s money” for their personal benefit. In the past Berne’s wife and daughter were paid annual salaries out of his senate reelection funds with questionable job titles and duties. Bernie’s wife was also involved in questionable financial transactions involving millions of dollars when she was president of Vermont College. After the primary election they bought their third home, which is an expensive “vacation” home. The mayors of Chicago, San Francisco and other “sanctuary cites” doubled down in recent press conferences reinforcing there decision to be “sanctuary cities”. Some of them have pledged tax dollars to pay the legal fees for illegals fighting deportation. The California legislature hired Eric Holder to help them oppose the Trump Presidency in court before Trump is sworn in. This is obviously tax payer dollars. For the record Eric Holder is the only U.S. cabinet member in history to be held in “Contempt of Congress” for deliberately lying to Congress and deliberately withholding information from Congress. I actually watched his testimony before Congress on two occasions and it was obvious that he was not only guilty of both charges, he did it with an arrogant indifference, and then made public speeches afterward claiming it was all because of his race! Obama made illegal recess appointments to the National Labor Relations Board (NLRB). The NLRB, with its new members immediately began to issue a stream of new regulations on their own, not through Congress. These regulations had dramatic negative effects on many American businesses. The NLRB continued to do this unabated until the law suit filed against the recess appointments finally made it to the Supreme Court where the ruling against the appointments was 9 to 0.Unfortunately most of the damages done by all the new regulations issued by the NLRB during the time it took for the case to make it to the Supreme Court cannot be recovered and many of the regulations are still being enforced by the Obama administration while the legality of the regulations is being litigated. Note: one of the illegal recess appointments is the daughter of James Clyburn the number three ranking Democrat in the House of Representatives, and one of the most outspoken members of the Congressional Black Caucus. Senator Schumer has publicly announced that the Democrats in the Senate will question all of President Elect Trump’s picks for his cabinet and other positions which require Senate approval, and that he expects the process to take months. Obama’s picks were approved in days when he was elected in 2008. Schumer also publicly said that NONE of President Elect Trump’s picks for the Supreme Court would get approved by the Senate in the next FOUR years if they did not meet what the Democrats considered to be acceptable standards. RINOs, McCain and Graham made this situation even worse by publicly acknowledging that “some” of President Elect Trump’s picks did need to be “questioned”. This public position by the RINOs is the exact opposite of the public position they took regarding Obama’s picks over the last eight years. In fact McCain publicly justified his quick votes for Obama’s picks by publicly saying the President was entitled to choose who he wanted for these positions. Keith Ellison, Democrat Representative from Minnesota is the leading contender to be the new head of the Democratic National Committee (DNC). He is the only member of Congress to be sworn in on the Koran, is an avowed member of radical Muslim organizations like CAIR, has made pilgrimages to radical Muslim countries (paid for by radical Muslim organizations) and has published articles demanding that all white people pay slave reparations to all black people (and other similar topics) using his Muslim name Keith E Hakim. Obama has endorsed his run for DNC Chair. Donna Brazile is still the acting head of the DNC even though details of some of her unethical/corrupt activities while she was in this position and was a CNN correspondent have been made public. She was fired from CNN for these same actions. There was a remarkable book, “THE CONFESSIONS OF CONGRESSMAN X” published in 2015. It is only 69 pages and you have to order it on-line, but it is well worth the effort. It details just how dirty you have to be to keep a Congressional seat in Washington. Obviously this list of examples of what a “cesspool” Washington is could be endless about people from all political parties or no solid political affiliation, but I think these examples illustrate how broken our political system is today, especially on a national level..
Getting President Elect Trump elected was only the beginning. 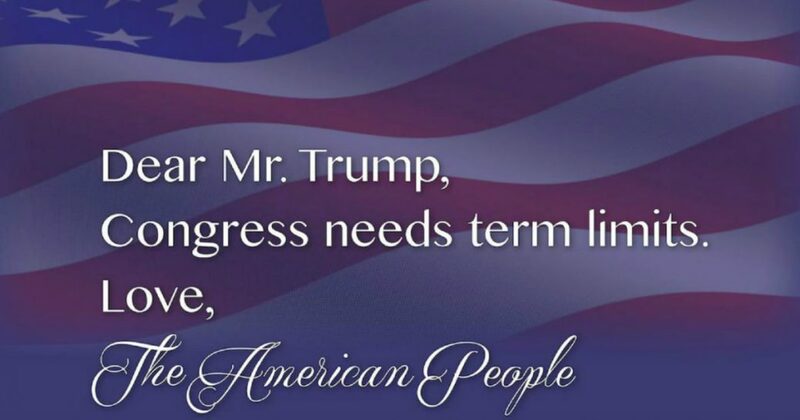 We must continue to support him, his staff and the actual Conservatives who are in Washington so Trump can do what he set out to do. Stay informed and involved. Communicate with your elected representatives and demand changes regarding term limits, open public records, transparency in all government activities, fiscal responsibility, and reasonable performance standards for all government employees.